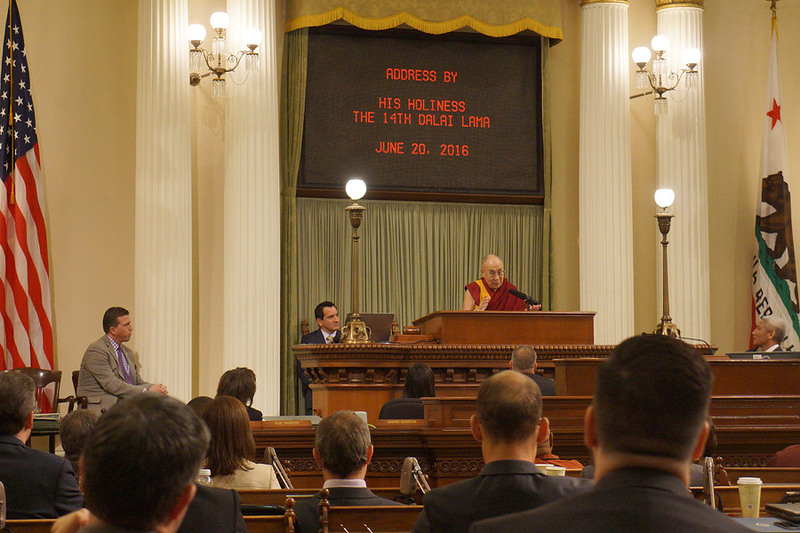 (TibetanReview.net, Jun23, 2016) – Tibet’s exiled spiritual leader, the Dalai Lama, on Jun 20 addressed a joint sitting of the two houses of the California state Legislature in capitol Sacramento, USA. His speech covered issues of “compassion, the environment and ethical leadership,” as explained earlier in a press release Jun 18 by Assembly Speaker Anthony Rendon. The Tibetan leader was earlier received at the Leland Stanford Mansion, the state’s official reception centre, by Governor Jerry Brown and his wife. They were joined for lunch by Senate President pro Tempore Kevin De Leon, Speaker Anthony Rendon and his wife, and Senator Janet Nguyen. Introducing the Dalai Lama, Speaker Anthony Rendon said the 1989 Nobel Peace Prize was an acknowledgment of the Tibetan leader’s consistent message of peace, non-violence, compassion and inter-religious harmony, as well as for his concern for our natural environment. He thanked Senator Janet Nguyen for having invited the Dalai Lama to address the state’s lawmakers, noting that in these unsettled times love and compassion were necessities, not luxuries. In his address the Dalai Lama emphasized the sameness of all humanity and said the best way to take care of ourselves was to take care of each other. He said leading a happy life depended on our mind being at peace and that we needed to pay more attention to the inner values that were the key to our happiness. He then declared that his first commitment was to promote awareness of human values as a source of lasting happiness. Referring to his second commitment, namely to working to foster inter-religious harmony, the Dalai Lama said all religions had the potential to create more compassionate and good human beings. On education, the Dalai Lama said it should not focus mainly on materialistic goals. Rather, it should be broadened it to include education in secular ethics having universal appeal to all religions. He appealed to the legislators to consider and support innovative changes to education that can lead to the emergence of happiness and peace for all human beings. After the speech, the Dalai Lama posed for photographs with members of the legislature in the Senate Chamber, attended a short reception in the Capitol Rotunda and then left for Salt Lake City. Earlier, in 2009, Assembly Democrats had balked at a resolution introduced by a Republican lawmaker to honor the 50th anniversary of the Tibetan people’s revolt against Chinese rule. At the time, the resolution’s author, former Assemblyman Sam Blakeslee, R-San Luis Obispo, said Democrats yielded to pressure from representatives of the Chinese consulate in San Francisco, who lobbied against the measure, noted eastbaytimes.com Jun 18.